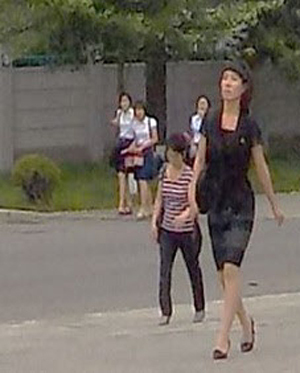 North Korea is cracking down on women wearing short skirts and banned people from imitating dance moves by South Korean music groups. The war on capitalistic influences brought on by the Korean Wave comes despite an unprecedented thaw in cross-border relations that saw North Korean leader Kim Jong-un enjoy a performance by South Korean pop stars in Pyongyang. The Daily NK website quoted a source in North Korea's Ryanggang Province as saying, "North Korean authorities summoned high-ranking provincial officials ahead of the U.S.-North Korea summit and lectured them on the subject of tightening the latch of socialism against the onslaught of foreign ideologies." Anti-socialist acts such as wearing short skirts that rise above the knee entail a 5,000-won fine, while wearing fishnet or floral-pattern stockings and clothes featuring English words is also banned. Other anti-socialist acts include criticizing the regime, owning illegal mobile phones, watching or listening to South Korean movies, dramas or pop music and "provocative" dancing. "Provocative dancing refers to copying the dance moves of South Korean K-pop idol groups, which has been spreading in Pyongyang," the source said. "A lot of young people have been paying for dance lessons." Violators will apparently be punished without trial. One researcher at a state-run think tank said, "After Kim ordered officials in December of last year to wage war against anti-socialist developments, crackdowns have been bolstered. The North is using its state-run media to instill ideological discipline and is implementing monthly crackdowns on violators."